Two-year-old Bullpit pushed an obscure stallion to fore with a narrow Moonee Valley win on Saturday. The Danny O'Brien-trained gelding is one of eight progeny to race by New Zealand-bred stallion Speed `N' Power. A son of the great sire Zabeel, Speed `N' Power was a high-priced yearling as a close relation to the champion Might And Power. However, Speed `N' Power never raced. 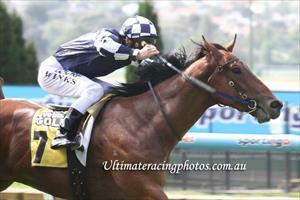 Bullpit became the stallion's fifth winner when he claimed the Friends Of Epworth Handicap (1000m). The Flemington-trained youngster had trialled well, winning at Cranbourne, prior to contesting a listed race on debut at Flemington on March 1. The gelding disappointed, though, beating only one home, but he showed the benefit of that outing when sitting outside the speed and finding plenty to score at his second time of asking in today's 1000m event. Jockey James Winks said Bullpit relished racing around a turn rather than the Flemington straight course where he finished seventh on debut. "I was probably never going to get beat today," Winks said. "He just raced upside down last time out up the straight." Ms Mazetti's jockey Mark Zahra said the Robert Smerdon-trained filly would benefit from the addition of blinkers or winkers. "I was going to get beaten easily but she got going again," Zahra said. The $81 outsider Rich Enuff finished well from midfield for third.